This is the fifth of six books I need to read to complete the Scandinavian Reading Challenge and is the only one set in Finland. If there is a Kittilä Tourism Authority I’m guessing James Thompson isn’t on their Christmas card list. In Snow Angels, part police procedural and part observation on Finnish culture and traditions, he has painted a unflattering portrait of the winter holiday resort in the northern part of the country. Against the backdrop of the investigation of a brutal crime Thompson shows us a country with one of the world’s highest suicide rates, where alcoholism is prevalent and resentment and abuse of foreigners is if not universal then fairly widespread. If that were all he showed then the book wouldn’t be much of a read but, using knowledge and experiences gained during his ten years living there, Thompson, who is American by birth, also depicts some of the subtleties of the culture which help to explain why people act the way they do. He also highlights some positive things like the community’s practical and drug-free way of dealing with a resident with mental health issues. For me this exploration of the customs and cultures of the region was the most successful aspect of the book. The crime in question is the murder and disfigurement of a beautiful Somali immigrant, Sufia Elmi, who had gained some fame as an actress in her adopted country. It is an uncommon crime but Inspector Kari Vaara is confident he can solve it. When evidence points to the new lover of his ex-wife as the murderer things do start to get complicated for Vaara and the investigation spirals out of control fairly early on. At one point Vaara seemed to be following a logical, evidence-based trail but then story then morphed into pondering his series of weird and wacky theories, based more on guesswork than facts. I think this loss of plot strength stemmed from the first-person point of view in which the whole story is told. This POV also provided for some clunky exposition which would have been far more smoothly integrated in a third-person story. The characters in Snow Angels go a fair way towards making up for the plot problems though. Kari is hiding some demons of his own but not to the point of being a hopeless alcoholic like so many of his fellow fictional detectives. His new marriage to an American woman is portrayed believably, with her difficulties in adapting to the country being thoughtfully depicted. Having once had to go to hospital in a country where I didn’t speak the language I could entirely identify with Kate’s fears and frustration at the way she perceived her treatment in such a circumstance. Most of the minor characters, like the succession of truly horrid people inhabiting Sufia Elmi’s life and Kari’s fellow police officer Valtteri, are also credible even if some of them are abhorrent. I do agree with Maxine at Petrona though that the victim is never really fully fleshed out so it was difficult to become wholly absorbed by finding out what happened to her. The book could have spent less time repeating the horrible mutilations done to her and more time letting us get to know her back story and how she ended up in such horrid circumstances. Reading this book made me think about the impact of the author’s perspective on storytelling as it’s the only one of the books I’ve read for this challenge written by someone who isn’t Scandinavian by birth. It’ fairly common to read books by ‘outsiders’ set in the US or UK or even Australia but to come across a non-local but knowledgeable perspective of a fairly closed society like this one is fascinating. Overall I enjoyed the read and could forgive some of the plot problems of the debut novel because the setting and characterisations were well realised and I will happily read another story in which they feature. Though I’ll hope it’s summer time and the poor folk get a bit of sunlight in their lives. This entry was posted in book review, Finland, James Thompson, Scandinavian Reading Challenge 2010. Bookmark the permalink. A really fine review – as always. I agree that the outsider´s view on the Finnish environment is the very best point of this story, and that he is better with characters than with plot. And if only modern writers would forget about this first-person narrator. It can be good in short stories (I have written some flash in the first person + present tense and there it works), but is unsuited for most longer stories. Bernadette – Thanks for this excellent review. Characters really can make the difference in a novel, even if the plot is a little “clunky…” And I have to agree with you and Dorte about the first-person POV. I’ve certainly read novels where it is effective, and it can be engaging. But it’s very difficult to pull off successfully. I can only think of a few authors who do it well. Great review, Bernadette, and thank you so much for the reference in it. I think your take on the book is a very fair one. I think the author is really talented and hope he writes more. I liked the police aspects of this book (though not the remote boss bit) and his descriptions of the way of life, eg the village where his parents lived, but thought the plot, perpetrator, etc less likely or plausible. I do hope he writes more, though. Just want to say thanks for the thought you put into reviewing SNOW ANGELS. I don’t normally comment on reviews because it’s usually a bit unseemly for an author, but Maxine has commented on SNOW three times that I can think of, so I didn’t think thanks to both of you is out of order. I’ll share just one small thought with you. 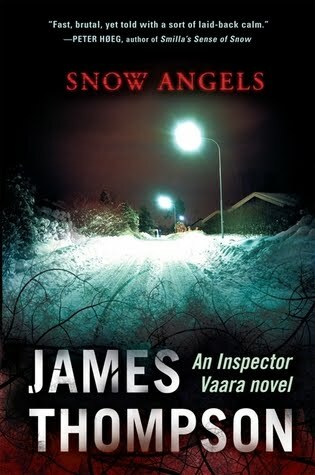 SNOW came out in Finland eight months before it did in the U.S., and the feedback from reviews was much different, especially regarding the protagonist pursuing unlikely avenues (no one here mentioned it), such as the possibility that the protagonist’s father had some involvement with the crime. 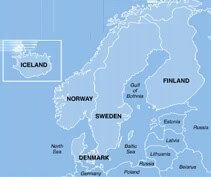 I was puzzled by such comments at first, but then a Finnish reader wrote to me about one such comment in an American review, “clearly, the reviewer has never been to Finland,” and the lightbulb went on. I wrote the book for a Finnish audience and never thought, when preparing the English language version, that some explanation might useful. For Finns, the concepts of duty and order are deeply ingrained. Usually, we perform our jobs to the best of our abilities, pursue things to the end of the line no matter what, even if the results will likely come to nothing. This was the case with Inspector Vaara, even in his haggard state, and I wrongly thought that international readers would pick up on it, which most didn’t. So, live and learn. If you’re interested in my reasons for other choices that you found problematic, please feel free to ask. I regard every book I write as a learning experience, SNOW included, and feedback from reviews has been enormously educational for me, hence my gratitude. The second in the series, LUCIFER’S TEARS, will be released in March. Publisher Putnam and I recently contracted for two more books in the series, for a total of four, so Inspector Vaara and I will be around for a while. I don’t know if most readers of SNOW are aware of this, but I’ve written seven books. Five novels, four of which have been sold. Only SNOW is currently available in English. I’ve published two other thrillers in Finland and LUCIFER’S is ready for publication. Another thriller (my first), which I haven’t offered for sale, a co-authored instructional book, teaching English to adult Finnish learners, and a Master’s thesis about occult influences in the early work of WB Yeats, which I suppose is gathering dust in the stacks of the University of Helsinki library.